Mayor paid 40 teen boys to play hoops in underwear | PinOy SPY! This may sound totally ridiculous and insane, but a town mayor in the Philippines is now facing criminal and administrative charges for allegedy paying a group of 40 teenage boys to play basketball in their underwear in a public playground last year. But Mayor Ramil Del Rosario of Bagac, Bataan, Philippines said the charges were politically motivated, because the incident happened in April 2008 and his opponents were revising it now because of the upcoming elections. 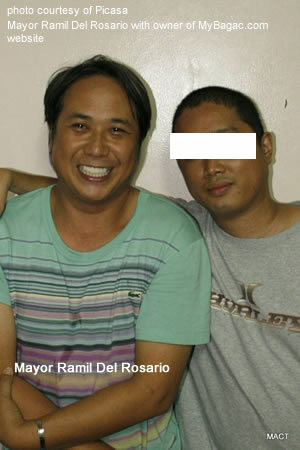 Mayor Del Rosario with a friend. But Del Rosario he said the boys were already playing in their underwear, when his men spotted them playing in the court. Contrary to the complaint, he claimed he offered them money so they will get dressed and stop playing half-naked. Due to the hot tropical weather in the Philippines, men playing basketball shirtless is a common sight, but men playing basketball in their underwear is not yet common. Tumataba na ba si Tita Glo? Hi there, this is actually a blogengine web site right? Can you take a look why it seems i cannot get any comments approved on your blog site? I mean i am having a wonderful read right here and I simply just try to provide a small postive responses on your blogposts 🙂 I discovered some exciting posts here btw.. Keep up the wonderful work! I admire the valuable info you supply in your articles. I’ll bookmark your weblog and check again here regularly. I’m fairly sure I will learn plenty of new stuff right here!